From the start of CDS Media, I was uploading story parts to both a Star Wars story and a Pokémon story. The Doctor Who-Star Wars crossover happened, along with two original creations. Even Animal Crossing got a small look in before the last remaining core of my franchise likes. In May of 2013, I announced the start of a story relating to the Sonic the Hedgehog series. 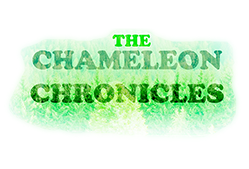 The first post of The Chameleon Chronicles was in July of 2013, but it wasn't until a full year later that the story really started and had its second post. That drought of content set me back a bit on some of the longer stories. But for one that had just started? It needed to be reintroduced. This is a look across all that The Chameleon Chronicles stood for. As outlined before, I had an idea that would suit a mainline Sonic the Hedgehog game, but I wanted to focus away from Sonic himself for a story to be posted on the site. What was happening in the background would be a good way of keeping away from Sonic, but of course the other characters would still be around. I focused on Espio, what with my favourite character being Espio. However, I'd made custom chameleons that feature at just the end of the mainline story as a way of showing Sonic would rescue anyone. Focus for the side story was then put onto them. I then worked on crafting the story based on what happened during the mainline story. Both of the stories started becoming more richer in content, and a clear path could be seen between the two. The mainline story ran over four days. A day is added to either side of that for the side story, which would focus on beginning and aftermath for the family of chameleons. I didn't want much communication with anyone other than Espio, who would be the guide, but as the story progressed certain cameo appearances became expanded - particularly the other members of The Chaotix. Crafting the home of the chameleons was fairly easy based on both the comics and the few times in the games where family and community are explored. Humans are technologically advanced, and live in the cities. That doesn't stop the anthropomorphic characters from working or living in them. However, most of the anthro's live in smaller communities, most of the time based on species. This chameleon village started out small, so the main square, mayoral building, and the surrounding houses were built first. In other words, the main square is free of trees. Down the line, bushes were grown around the main square so it acted as an open-aired building. More houses were built as more families moved in, though these were further from the main square - which became more of a center - and soon the village became whole. The further from the center the buildings were, the more trees surrounding them. Of course, to make the world feel whole, the other areas of the main storyline had to be added. The forest was split into three. A high level where the chameleon village was, split into two forests. On a lower level, another forest which leads into the city. Roads coming out of the city pass by the forest, which then leads by the chao garden. There also needed to be the inactive underground lava field, which I placed outside of the main forest area, but pulled a path through the underground and out of the rock face of the cliff that separated the two levels of forest. This needed to be done for the transition between areas for Sonic in the main storyline. That didn't stop me putting a hint in the side story that Sonic was on the move, as I did numerous times. As with any story, introducing the characters is key. Introducing the setting, the situation before the plot shifts gears, and any connections between people and places. I dedicated the first chapter to do this, while also continuing it in the second chapter having introduced the main problem. Within those first two chapters, I wanted to get within the heads and thoughts of the two brothers. It's also a theme throughout, where overlap happens between paragraphs just so I can get a different perspective on what is happening from the other brother. Sometimes they share the same feelings, just in different ways. I took that further in chapter three to explore a number of feelings each brother was feeling. Hopelessness started to take over in chapter four, and having reached the bottom rung of emotion, I wanted to introduce a perk that would raise their spirits. That's where Espio came in. The way it was going to run was much the same as it did. However, for chapter five, after Espio was filled in to the situation with the brothers, they would head to the chao garden with Vector on the boat - as did happen. There they would meet Cream. After the meeting of the night, that would have been the last seen of both until the end. Charmy had much the same role, though cut a bit. After Sonic overtakes in chapter seven, events would unfold as they did, but instead of a conversation while stood still, it would happen on the way to the cannon that fires people to the gravity corridor. Knuckles would be waiting, and the two take the cannon after instructing Espio to destroy it after the two have used it. Chapter eight then would commence with Zoin taking charge, saying that if their sister was on that base, he wanted to be in the thick of the action. So the cannon is set to self-destruct after it fires one last time, and the three find themselves within the gravity corridor. While traversing it, comm-talk happens between The Chaotix members as they coordinate their positions. After reaching the base, the story would then continue as it did in the published work, except only Espio would head back to the village with the two brothers and their sister at the end. I felt that I wanted at least the core Chaotix to get a bit more attention than they were, so I tested a few things, and those that are published didn't affect the story much at all. The Chameleon Chronicles helped in the development of the mainline story, as it meant I knew exactly where everyone was at every part of the story. And someday down the line, that main story could be told. But it also means I now have the means for more stories within this world I have created. Zoin and Krona have experienced proper adventure, both experienced a lot of feelings and met new people and visited new places. The Extended Chaotix, as I call them [with both Mighty and Knuckles], can also be featured - either in their own stories or as part of another adventure with Zoin and Krona. Going through the development of this story has certainly focused me on developing others further, rather than the fully improvised version I've been doing for nearly every other story. And there's also the fact that this is the second fan fiction story fully completed. If there's anything else you want to know, I am welcome to questions relating to this story. April has been a busy time. With projects to complete for uni, nearly everything else has been sidelined. The deadline is fast approaching, and all that work has now been finished. So normal service resumes here. -looking at LEGO Star Wars: The Force Awakens and what could happen within it. -a post about The Chameleon Chronicles that looks back on it and giving some thoughts upon it. If I can get through all of that, then there might be other things as well. However, that's not to discount the work I have been doing for university. The main piece of work will be uploaded, and the other piece will follow. There will also be a showreel that will feature some of my works. This has been a small update, so keep a look for the content.